So last week I headed to the English corner. It was a bit of a mob. I’d start chatting with someone that I wanted to get to know better, then have a crowd swarm me and pepper me with questions about America, and the Chinese student I was actually having a conversation with would give up and wander off. That happened a few times before I finally actually got to know a couple of Chinese girls. So— I finally know some Chinese people in China! Totally a success. I also spent an afternoon at the Summer Palace with a few friends. 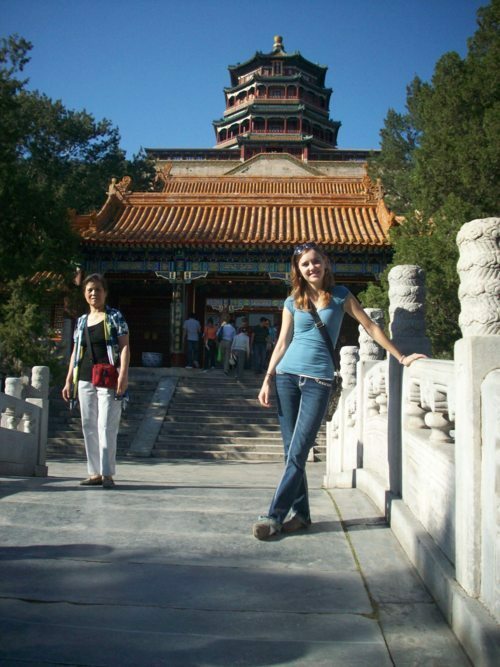 It was really beautiful, and I was particularly interested because I had focused on the Qing Dynasty last year in a few of my classes and the Summer Palace was a pretty historical spot. So I got to be a nerd and sight see, and it was a beautiful day in Beijing with blue skies and sunshine. The weather in China is already starting to get cold, and I just have tropical-island clothes with me from the summer, so I headed to the Zoo Market with another American girl this weekend. (There are very few Americans here, even among the international students.) The market consisted of four towering buildings that are filled, top to bottom, with stalls selling everything you could ever possibly imagine. Now, I really hate shopping, but this was novel enough (at first) that I was all for it. It’s hot and crowded and people are shouting back and forth about prices and deals and why you should buy this or that. We wandered up and down aisle after aisle of cheap clothes and housewares, trying to figure out what was worth haggling for and what would just end up a waste of time. I ended up walking out with a few bags of fall clothes; in China, a few US dollars can go a long way. Last night I headed out to Sanlitun with Quint (the other American girl) and a few other people. Most weekend nights everyone from the international dorms head out to go clubbing, which is fun, but let’s face it— I’m no dancer. So last night was a nice change of pace. There was some pretty fantastic Italian food involved (oh, how I had missed Italian food! ), and then we headed to a hookah bar for awhile, and ended up munching on pizza and beer by the end of the night. Now I’m busy trying to figure out plans for the first week of October… It’s a bit of a gamble because I’m not certain that the visa office will be done processing my request for a multiple entry visa (did I mention that things take a long time here?) but we get a week off because it’s China’s national holiday, and the time off seems like a pretty good opportunity to go and visit a few people and places I’ve been missing in Taiwan. Yeah, it’s only been a month since I left… But I’m crazy in love with that little island.